Freeboard in a canoe is the amount of canoe sticking out of the water. 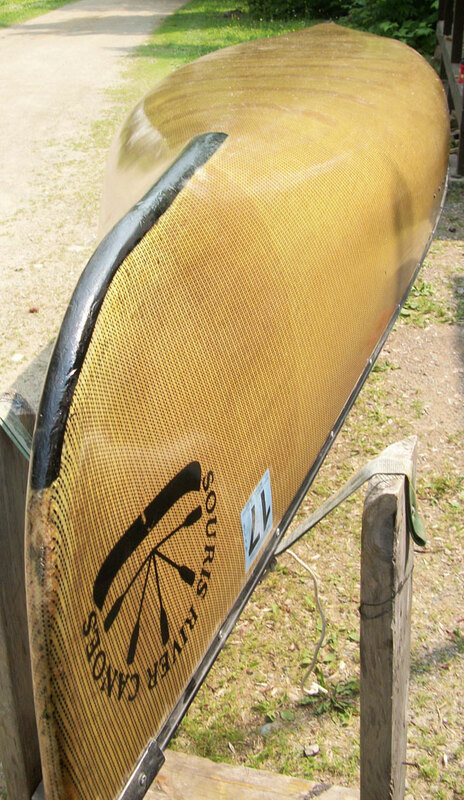 In rough water there is more going on with a canoe than the average paddler might consider. A canoe with more wetted surface, that is, the bottom of the canoe which is supported by water as the canoe floats on it, will generally float higher than a canoe with less wetted surface. The amount of freeboard that is built into the canoe along with the canoe’s ability to rise on the water’s surface (bouyancy) are the two important factors if you like to stay dry. A canoe caught broadside to big waves and without realistic freeboard can be a big problem especially if the canoe isn’t a bouyant. Narrow racing-oriented canoes with shallow-arched bottoms tend to settle into the water deeper when carrying a payload like camping and fishing gear. If that canoe was designed with low freeboard to begin with, it’s going to sit even lower in the water with weight in it. If the canoe is narrow such that the bow seat paddler can’t put both feet side by side in front of him, this canoe will tend to resist riding up with the waves of the lake. 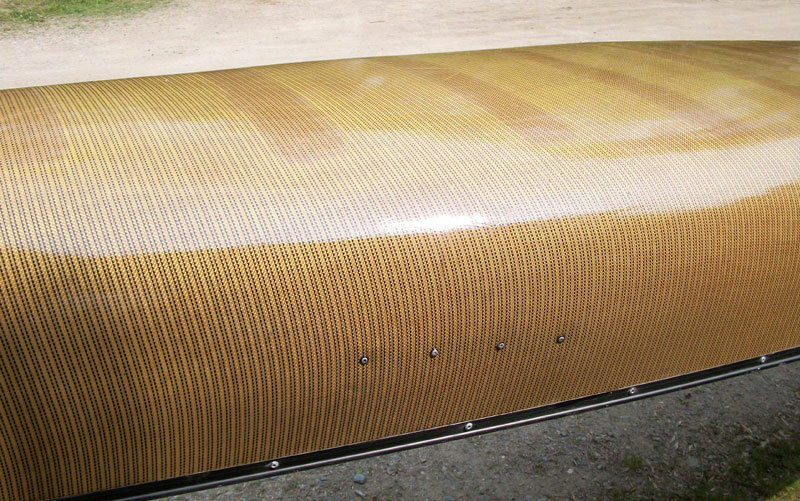 Instead, the waves will tend to ride up around the canoe as opposed to lifting it upward because this more “knifelike” hull doesn’t resist the water but instead accepts it. As a result it is less bouyant and less vertically responsive. For racing-oriented canoes which will not be carrying a big load, that may be OK if you don’t mind the increased chances of getting wet. This type of hull will do very well on a calm day. Add a little significant wind and you’ll be riding an unfamiliar, much less predictable canoe. 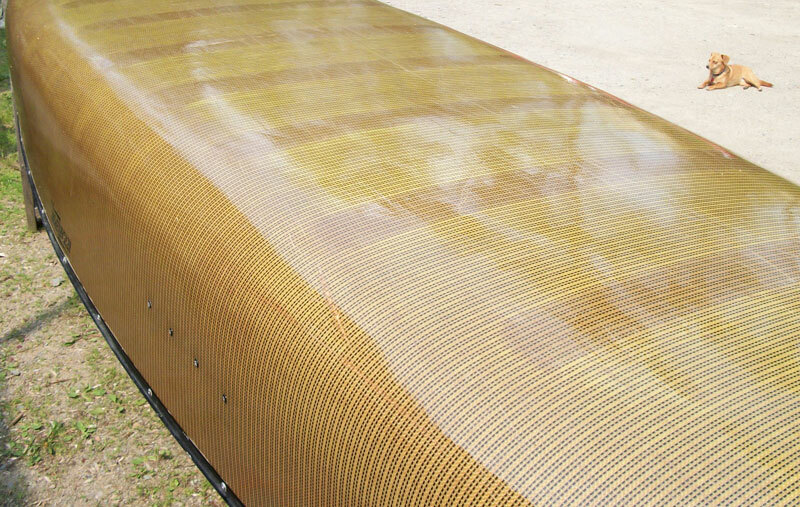 With regards to decreased bouyancy, several different Brand X kevlar canoes out there are notorius for taking on water from the place you’d least suspect: the stern. Designers of racing-oriented canoe hulls don’t appear to take into consideration that a following sea with big waves can be just as bad and sometimes worse than heading into the wind and waves. Heck, anybody who has real experience in a boat with a motor (that is an actual boat, not the term used for canoes by hip wannabes) in rough water going with the wind knows or learns rather quickly that you need to watch so that you don’t sink the bow under a big wave or have a big wave that’s curling behind you force it’s way over the back of the boat at the same time. You also cannot travel too fast or too slow – well you can, but you’ll run into huge problems really quickly from either end. A canoe is no different and canoe hulls that don’t ride up and over waves will get in trouble VERY quickly from the bow OR the stern. Don’t believe me? Just sit up on Bailey Bay of Basswood Lake when it’s rough and watch the Brand X kevlar canoes and the Souris Rivers cross the water with a big, following northwest wind. Then see which canoes get helped out by passing boats if they’re lucky (again, meaning actual boats here). If you still cannot figure it all out by watching which kevlar canoes go down and which make it across high and dry, there is no helping you. And yes, I am fully aware that several other canoes can and do make it across rough waters, it’s just that I also know that SR’s tend to do a better job with a lot less dunkings. A canoe with more surface area resting on the water will ride up in waves. It also helps if that canoe has shallow arching on the ends that aid in lifting the bow and stern as need (and the arch adds secondary stability as well). With a sharp knife entry/exit in the stems (the very ends of the canoe) followed by shallow arching, the canoe’s ability to ride up and over waves as opposed to becoming a submarine is increased. Add all this up with realistic freeboard to start and you have a canoe that’s worth owning if you are a non-racer and like to actually use the canoe in a variety of conditions. And for the last time, just because you’ve paddled a Brand X kevlar for one 5-day trip and never run into these types of problems before doesn’t mean that you’ll never encounter them. It’s only a matter of time.